The seven-part cantata cycle “Membra Jesu nostri” owes its origin to the close and lasting friendship between two musicians, the Lübeck organist Dieterich Buxtehude and the Stockholm organist and capellmeister Gustav Düben. It remains unknown when and how this friendship across the Baltic Sea developed, but Düben—Buxtehude’s senior by ten years—belonged to a 17th and 18th-century Swedish family of musicians who were of German descent. The first known member of the dynasty, Andreas Düben (1555-1625), was for thirty years, from 1595 until his death, organist at the St. Thomas Church in Leipzig. His son, Andreas (c. 1597-1662), enrolled 1609 as a student in the University of Leipzig, but left in 1614 in order to become a pupil of the organist Jan Pieterson Sweeelinck in Amsterdam, where he remained for six years. In 1620 he became court organist in Stockholm, in 1625 organist of the German church there as well, and in 1640 was appointed court capellmeister in Stockholm. His son, Gustav (c. 1628-1690), grew up in the Swedish capital, received his musical training primarily from his father, but reportedly also studied abroad, even though no details about his foreign travels are documented. In 1663 he succeeded his father in the positions as court capellmeister and organist of the German church in Stockholm. After his death in 1690, he too was succeeded by his son, also named Gustav (1660-1726). The latter was ennobled in 1698 by King Charles XII whom he followed into the Great Northern War (1700-1721) where he encountered and eventually hired for the Swedish court capelle Johann Sebastian Bach’s older brother, Johann Jacob (b. Eisenach 1682-d. Stockholm 1722). According to the Latin title page of the autograph manuscript of Buxtehude’s “Membra” the work is dedicated to the composer’s “amico” (friend) Gustav Düben. As the manuscript bears the date 1680, it is the first document of their friendship, which lasted for at least ten years until Düben’s death in 1690. Numerous manuscripts of other Buxtehude works, primarily vocal compositions, can be found in Düben’s rich music collection (today in the University Library of Uppsala) and provide further testimony to their close relationship. Moreover, in most instances they represent the only extant sources of many works of the Lübeck master. It is unclear but seems likely that Düben commissioned the “Membra” from his friend for performances in Stockholm. Whether the work was also performed in Lübeck is not known, but the Abendmusiken series at the St. Mary’s Church under Buxtehude’s direction would have been an appropriate venue. The full Latin title of the cycle (from Buxtehude’s autograph) reads “Membra Jesu Nostri Patientis Sanctissimi” (Most Holy Members [of the body] of Our Suffering Jesus”). This multi-sectional sacred work of non-liturgical character is based on lyric poetry of medieval mysticism, usually attributed to St. Bernard of Clairvaux, but more likely written by Arnulf of Louvain (1200-1250). The source for Buxtehude’s text seems to have been an edition published 1633 in Hamburg under the heading “D. Bernhardi Oratio Rhythmica”. Ton Koopman and his alternative Weihnachtsoratorium in Christmas Cantatas! Sunday next op NPO 2 on TV: Podium Witteman with only Christmas music! Ton Koopman and his Amsterdam Baroque Orchestra & Choir will be there and they give us an alternative Weihnachtsoratorium of Bach extracted from the Cantatas. What better way to enjoy a Christmas Sunday! Complete works of BUXTEHUDE are now completely recorded by Ton Koopman! Ton Koopman on tv in Vrije Geluiden and a concert in Amsterdam with Dorothee Mields! Ton Koopman played in De Wereld Draait Door! Ton Koopman touring in Germany & the USA and the premiere of a documentary! 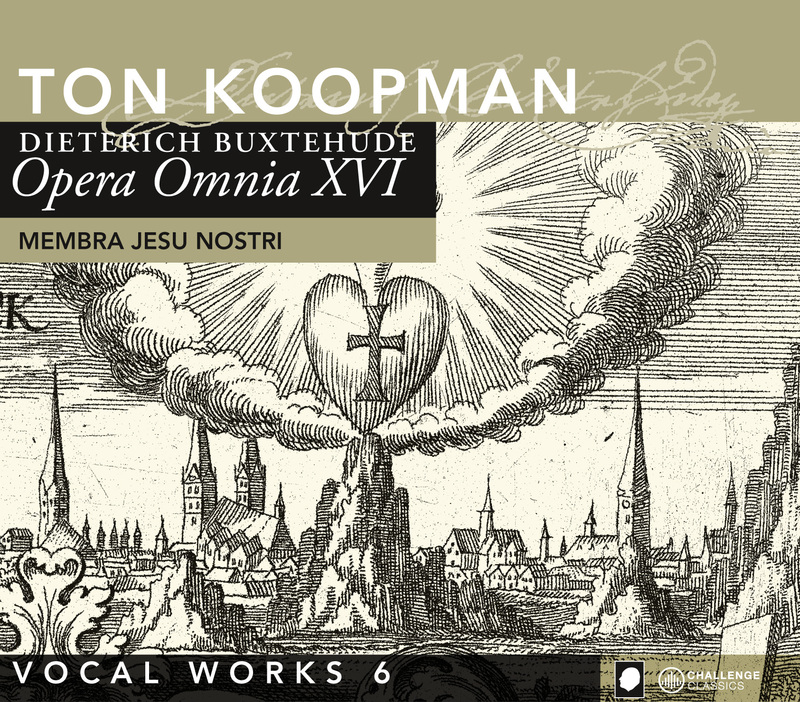 "Koopman captures the fascinating creative tension between the text, which is rooted in Catholic mysticism, and a sense of Buxtehude the northern Lutheran."